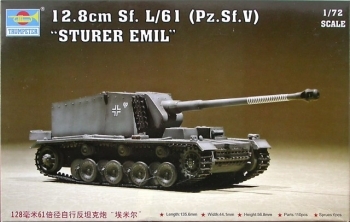 Here today we have a obscure german tank, the Sturer Emil from Trumpeter. BOX ART >> One of the few brands that just shows you the finished model. 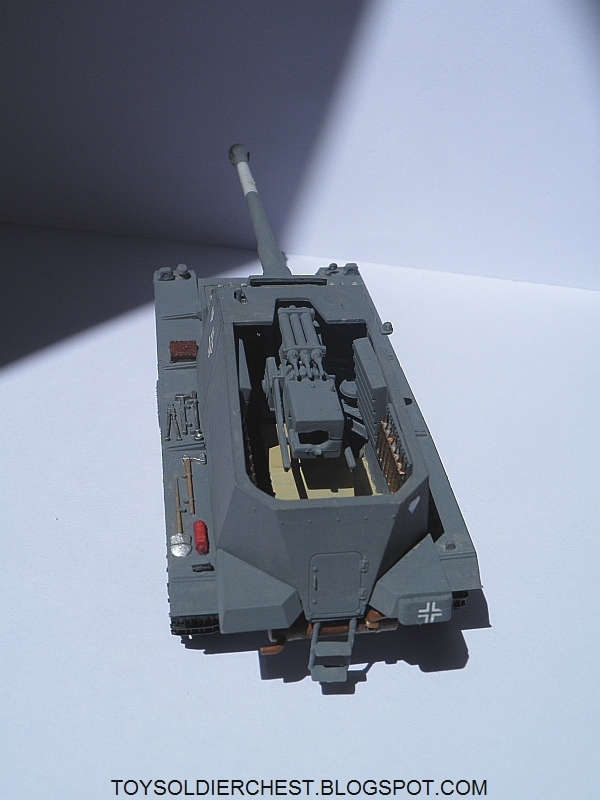 It serves well the purposes of seeing that it is indeed a nice model, and is a trademark for Trumpeter in their 1/72 kits. This is a very fine kit, with a high level of detail, nicely done interiors, all parts fits perfectly, no moulding marks, no filler required, and no accuracy errors (thanks I suppose because a example is conserved in the Kubinka museum, but a good thing all the same). If it doesn't have a 10, is because the quality of the decals is quite poor. They have not resisted just 6 month of storage after it was built, when they started to fall. You will have to purchase a special product to fix them to the model, or varnish them with matt varnish. Trumpeter is a brand that normally gives you a perfect vehicle, but if you want extras, go and get them yourself, is what basically they express. With a so big open hull, a small crew will have been very much appreciated. Yes, you read well, 0.0. This is a kit of tens and zeros. There were only two built, one was destroyed and the other captured by the Russians. The one captured is the one made, and the other one had the same camouflage, most probably. 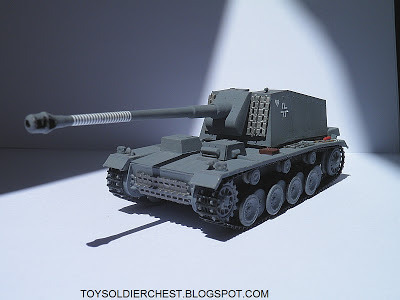 So you can either make the box version, or do the other one, where the only difference will be the white lines on the cannon which demarks the 22 kills the tank achieved. It is not a cheap kit, but it is of great quality. And a great quality kit in our days for less than 11 GBP like this one is hard to find. So it is fine. And you get a quite big model for your money, that always makes you happier than paying 11 GBP for a Vickers tank. "The historical importance score is determined by how many were built, and how much operational service they had, and how much influence they had on the conflicts in which they were involved"
Just two were made, yes, two. It would score 1.0, or 0.5, but one of the two achieved 22 kills when it was captured by the Russians, (if we believe the white bands the tank crew painted on the barrel). The other one got destroyed. So no, it didn't change the war, but it was clearly quite effective, or at least it's crew was quite expert. 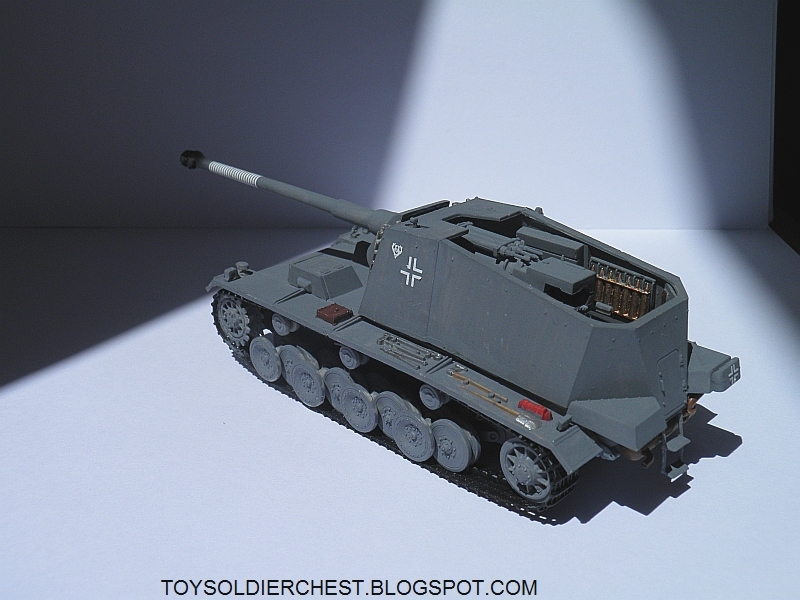 Although it is a kit that everything fits well, it is not a super quick kit to make, like an Airfix or Matchbox. 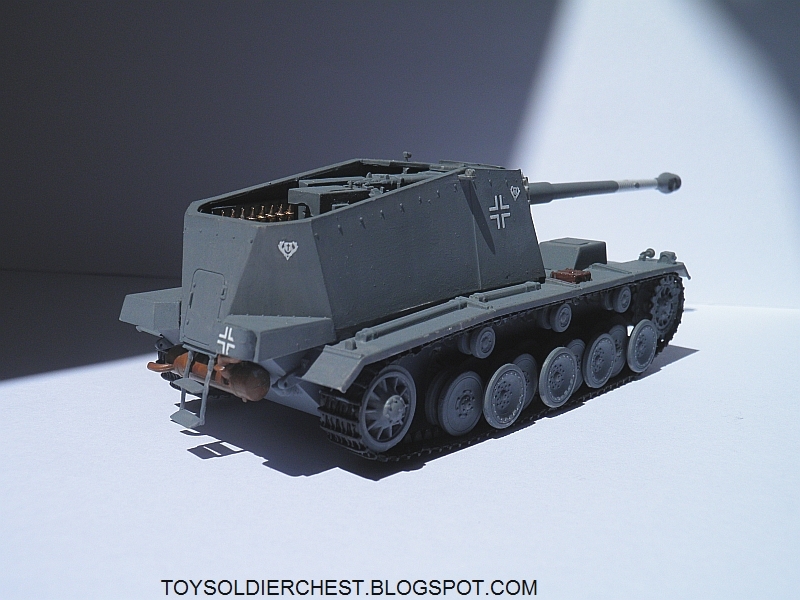 But all the same, it doesn't require great skills, and the final result is a sturdy and formidable tank. 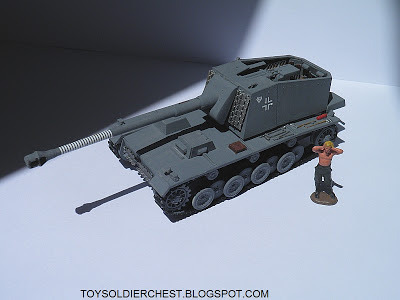 The other thing about this kit is that it can only represent in a generic way the multiple self-propelled guns the germans had, and was by no means a mass produced tank. This is a model most recommended to those like me who already have all the main german tanks, and want to have something different, albeit if all were used the same operationally. I always like kits that have really fought, and not just have been prototypes or scrapped after some testing. But obviously, there are quite a lot of other tanks which were much more important in the war.The design is a very distinct one, not the typical Sturmeschultz or Jagdpanzer, and with their typical small variations, this has a unique body. It is a pity that other nations don't have the coverage the german vehicles have had, with even the most rare and unique being modelled. Meanwhile, we still don't have some important British and Japanese tanks for example.